This week, we've added three new films to our Long Range Forecast. Thor, Something Borrowed and Jumping the Broom are all set to open on May 6. As the unofficial start of the summer movie season, the first weekend of May is easily one of the best launching points for a film. That spot has been occupied by Iron Man ($102 million debut), X-Men Origins: Wolverine ($85.1 million debut) and Iron Man 2 ($128 million debut) over the last three years. Thor will likely open to less than those films did for two reasons: 1) Star Chris Hemsworth is not nearly as recognizable as Robert Downey Jr. and Hugh Jackman and 2) Wolverine and Iron Man 2 both entered the frame with huge built-in audiences. Still, a successful weekend is almost guaranteed with such prime chunk of release-date real estate. 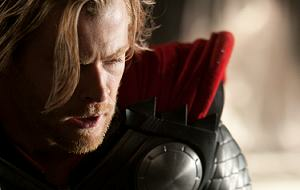 Something Borrowed will serve as counter-programming to Thor. Female moviegoers who could care less about the latest superhero flick will seek refuge here. Jumping the Broom will also skew heavily female, and it will lose a healthy portion of its potential audience to Something Borrowed. Expectations are modest.